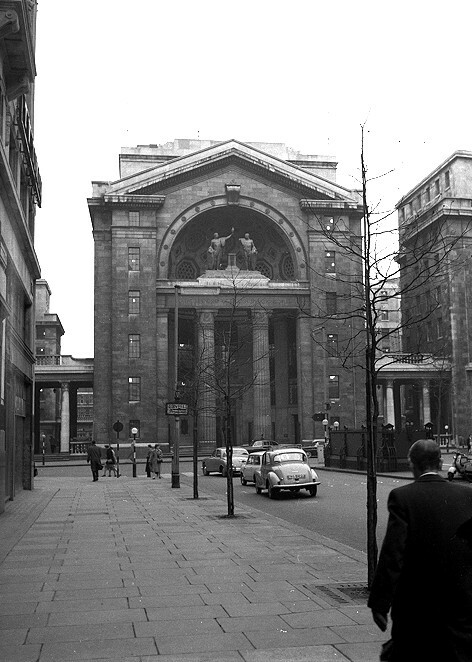 Bush House (seen in the picture in January 1962) was built between 1924 and 1935, and originally intended as an office building; the floors were open plan - an early, possibly the first, example of this in Britain - apart from the supporting pillars, and partitions could be arranged to configure offices or large spaces for firms to exhibit their products. It was even designed with a swimming pool, though it's doubtful it was ever actually filled. The BBC moved their European Services into a couple of floors in 1941; the Overseas Services came in in 1957: with this the BBC occupied the whole of the Centre Block and South-East Wing, and a few floors in the North-East and North-West Wings. Originally called the External Services the name World Service was adopted in 1965. I joined Engineering Department as a Technical Operator in Control Room in 1961, became a Studio manager in 1968 (this is not a managerial position, but constitutes sound mixing, recording and editing and the handling of radio transmissions, all for overseas audiences), retired from full-time work in 1995 and worked part-time as a casual until finally 'really' retiring in 2007. Over that time I took a number of photographs: many of those were of the technical equipment and it is those which make up the following pages on this site. Inevitably there are gaps - I never aimed to make a full coverage: now of course I wish I'd taken more, but it's still quite an interesting collection. World Service montage (1 minute 3 seconds).